The need for military railways was established during the Crimean War, because the muddy roads from Balaclava to Sevastopol held up the supply of ammunition for artillery use. 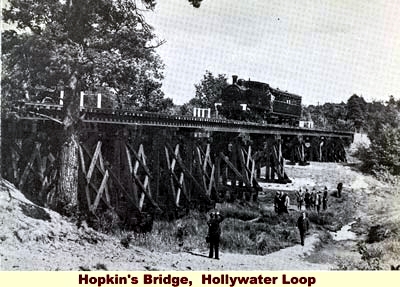 A 7.5 mile standard gauge line was supplied and built by contractors, but was operated by the Royal Engineers. After this armies used railways for the supply of ammunition and essential stores for the troops in Europe, the Middle East and the Sudan. Armoured trains were supplied for the Boer War, and they carried artillery, ammunition, troops, horses and essential stores. 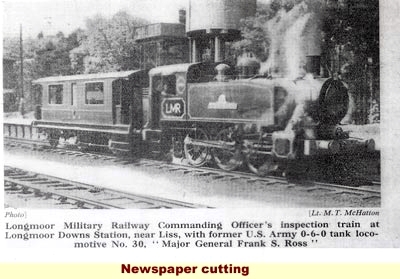 After this General Lord Roberts said that a training military railway was needed in the UK. 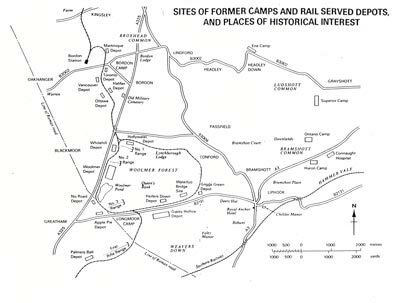 Longmoor camp and ranges were used for training before the Boer War, and due to a shortage of barracks for returning troops, the REs were asked to build a new camp for 3 battalions of soldiers at Longmoor. They were built with local timber and stone and sand from Weavers Down and a 1ft 6in railway and was installed for this purpose. All was ready by 1901. The soldiers were not impressed because some huts were in a swampy area, and it was decided to move about 21 huts to Bordon. A twin 1ft 6 track was built for the 4.5 mile run, and special bogies were ordered to take the weight of the huts (30 tons each) . Traction engines and tractors were used as motive power, and for the level and uphill runs all went well, but on bends the huts slipped a little on the bogies. On the downhill runs the huts tended to get away, and one hut fell off the trollies at Whitehill. It was left where it was , and was set up as the police station. The present police station is on the same site. The other huts went on to Quebec and other Barracks in Bordon. This was quite an achievement in railway terms, and it was also decided to build a standard gauge track round the outside of the Longmoor ranges. The Woolmer Instructional Military Railway was formed. This was partly implementing the wishes of Gen Lord Roberts, but it took some time before all of the funding could be assembled to build a full-scale training railway. The Bentley-Bordon link was opened in 1905, and 8 trains were run on weekdays and some at weekends. 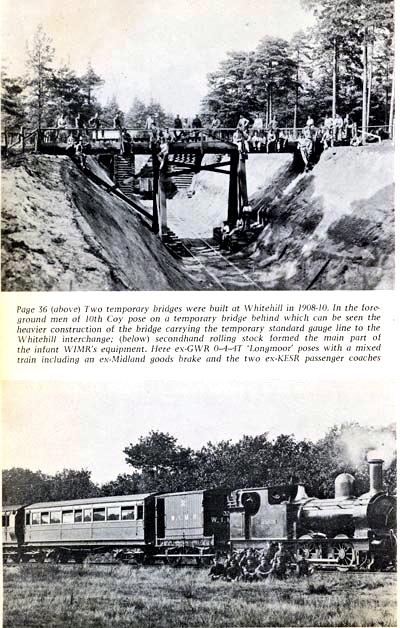 The road crossings at Whitehill and Bordon provided problems with the need for crossing keepers, and the Whitehill bridge and cutting was completed in 1908. 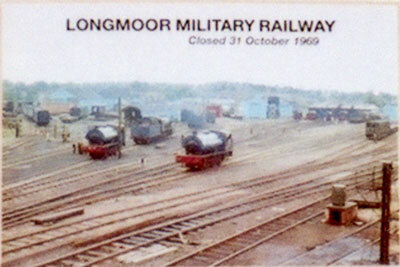 The Longmoor Liss link was also built about this time. With the coming of World War One (WW1), the French handed over parts of the SNCF in the north to the British troops to operate, and it was soon realised that standard gauge and 60 cm gauge tracks were involved. It was agreed to add narrow gauge tracks for training purposes as well at Longmoor. Palestine used a 2ft 6in gauge track, army and navy depots and overseas depots used 2ft gauge tracks and Woolwich Arsenal a 1ft 6in gauge track. It was not possible to standardise gauges, and so sections of all narrow gauge tracks in use were installed at Longmoor. In 1916 allied armies sent over troops with railway experience, and all existing troops with railway experience were taken out of existing lines, and formed in to railway companies. Also the Canadians sent over lumberjacks to cut timber for sleepers, bridge building uprights and other uses. 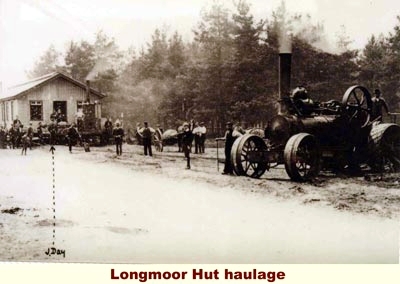 Training for all gauges was carried out at Longmoor, and troops were sent out to the different war sectors after training. 16,623 troops were trained between 1914 and 1919. France and Germany used 60 cm and 1 metre gauge railways as part of their infrastructures. Some were 1 metre gauge tramways, and 60 cm heritage railways still exist. In the USA 2ft gauge systems were operating before WW1, and that is why production of 2 ft gauge steam locomotives was so quick (10 months delivery for 595 steam locos. The UK delivered 1753 steam and petrol locos and 15,000 wagons). Some of these were delivered to Longmoor for training purposes. 2 ft is 1/2 inch greater than 60 cm, but with some tolerance rail stock built for both gauges worked on the different tracks. After WW1 the surplus locomotives and stock were distributed round the world. Some went to heritage railways such as the Ffestiniog Railway Company at Portmadoc, Froissy Museum in France and many mining and quarry companies. Some are still working and earning money. 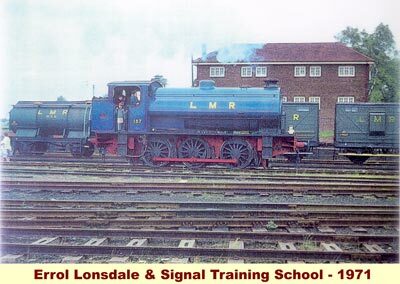 A full scale operating railway was installed after WW1 from Liss to Bentley, and the name was changed from WIMR to the Longmoor Military Railway in 1935. The funds available for military use in wartime are vastly different to those in peace time, and whilst WIMR/LMR carried on between the wars with training for regular and territorial troops, there was not much spare funding available. When Longmoor was asked in 1936 to provide two companies to run the Palestine Railways, the MOD was told that it would take a little time, because more funding was needed. After this the system built up again, and when WW2 broke out, troops were sent abroad to France and other countries to run the railways there. At home troop trains were run from Waterloo to Bordon and Longmoor, and the full railway system was working to fulfil transport and training needs. After WW2 the system was kept going and Longmoor Camp was run by a Brigadier until about 1966. 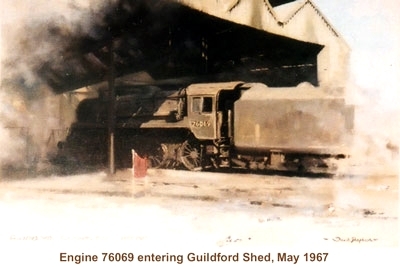 After this some railway enthusiasts like David Shepherd purchased steam and diesel locomotives, and obtained permission to run them on Longmoor lines. There was a move to close the railway, and the Bordon-Bentley link was closed first. David Shepherd and others tried to keep the Liss Longmoor link open for military and preservation traffic, but developers and some local residents were against it. The railway shut down in 1971 with a special commemorative programme. 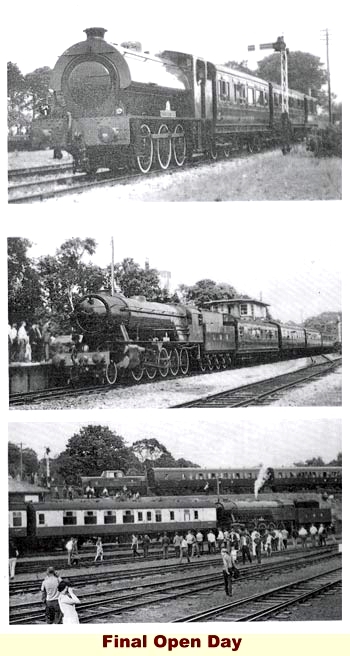 The locomotives and some carriages were sent to the Severn Valley and other preservation railways. The tracks were pulled up, and some memorabilia was sent to the National Army and the Beverley Museums for display and storage. As Beverley Museum is now closed, some of the photos and memorabilia are now stored with the Liss Area Historical Society, the Woolmer Forest Heritage Society, the MOD Longmoor and the REME Transport Museum at Bordon. A lot of the information and some of the pictures were obtained from the records of Lt Col Harold Rudgard OBE. He served in World War 1 firstly with the Infantry (5th Sherwood Foresters), and then with the Royal Engineers in France, and with the Woolmer Instructional Military Railway at Bordon/Longmoor. Lt Col Rudgard was firstly Superintendent of the IVth Army narrow gauge railways in the Somme Sector, and secondly with the railway workshops at Beaurainville. All servicemen who had had railway experience, and other volunteers, were formed into companies to run the narrow gauge (60cm) railways and most were returned to Bordon/Longmoor England for training. Courses for railway operation and track building and maintenance were set up with the Woolmer Instructional Military Railway. Lt Col Rudgard spent some time at Longmoor helping to set up the training. After WW1 Lt Col Rudgard returned to the Midland Railway, and took an interest in the Ffestiniog Railway Society (FRS). Some of the surplus locomotives from France were sold to mining, quarry and other industrial organisations world wide, and some found their way back to North Wales. The FRS has an ALCO (Mountaineer) and two Simplex locos and the Welsh Highland Railway had two Baldwins. Lt Col Harold Rudgard was Chairman of the FRS from 1955 to 1958 when he died.